Comcast, the US media conglomerate, has submitted another offer to buy parts of 21st Century Fox, after getting rebuffed last year in favour of Disney. Comcast said it has offered $65bn (£48.6bn) in cash for Fox's film and television studios and international businesses. The bid sets up a fight with Disney, which announced its own plan to acquire those businesses last year. The two firms are also vying for ownership of Sky in the UK. Comcast said its proposal is "at least as favourable" to shareholders as Disney's plan. 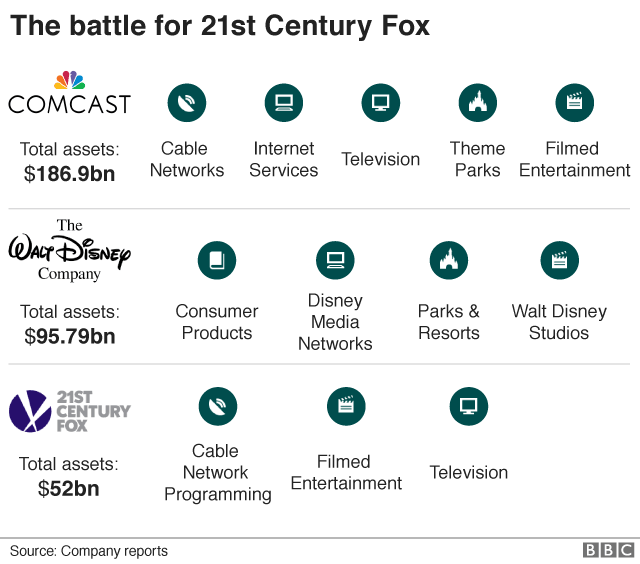 The firm is offering Fox $35 per share in cash, which it says provides more shareholder certainty and is 19% higher than Disney's proposal, which involves exchanging shares. Fox said it would "carefully review and consider" the offer. It said it remains subject to the terms of its deal with Disney, a stock transaction valued at $52.4bn, or more than $66bn including debt, when it was announced in December. That transaction, described by the two companies as a merger, was set to give Fox shareholders a roughly 25% stake in Disney. As part of the deal, Disney pledged to seek full ownership of Sky. Under both the Disney and Comcast proposals, Fox would create a new company to hold onto its news and sports businesses, including Fox News. The showdown over Fox is happening as the growth of online streaming and competitors such as Netflix reshape the entertainment industry. Comcast and Disney say Fox would bring original material and international reach that can help them compete. They are fighting over Fox's television and film studios, as well as international properties, including Star India and Sky. 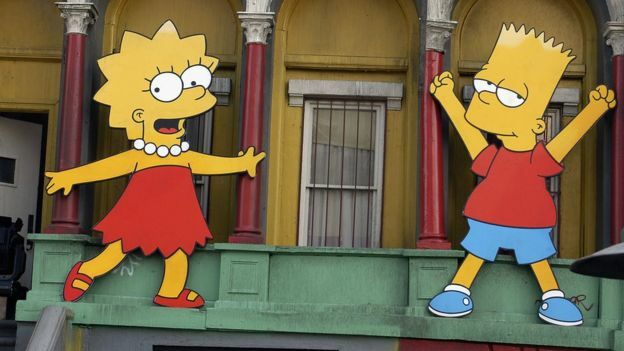 The firm's properties include the original Star Wars movies, the X-Men franchise and TV hits like The Simpsons. If Comcast succeeds in its bid, it would become a massive media conglomerate with few rivals in America. The firm, one of the largest providers of internet and pay TV in the US, already has a large television and film business, with subsidiaries such as NBC, Telemundo, Universal Pictures and DreamWorks Animation. Fox, which is led by Rupert Murdoch and his sons, rejected an offer from Comcast last year, citing concerns that antitrust officials would oppose a deal. But a court ruling this week on a similar merger may have alleviated those worries. On Tuesday, a federal judge cleared the AT&T's takeover of Time Warner, rejecting regulator concerns that the tie-up would stifle competition and lead to higher consumer prices. Comcast said it is confident it will win regulatory approval and that its new offer "fully addresses" the stated concerns. The firm's promises include a $2.5bn fee for Fox if it decides against the takeover. Comcast also said it would reimburse the money Fox would owe Disney for terminating that deal. Regulators are currently reviewing the Disney transaction. Makan Delrahim, assistant attorney general for antitrust, recently signalled that regulators were open to the combination. The tie-up with Disney would also carry a lower tax bill. Comcast's proposal is the latest attempt to merge content production with content distribution. Traditional telecommunications companies see these deals as vital to their survival in the cord-cutting era - an entertainment epoch in which streaming services like Netflix, YouTube and Amazon Prime have already gained a strong foothold. While Comcast had floated the deal for some time, it was waiting to see the outcome of an antitrust case brought by the Trump administration that was seeking to block America's largest pay-TV provider, AT&T, from buying Time Warner - the home of franchises like Game of Thrones, Wonder Woman and CNN. That case was dismissed on Tuesday, giving new impetus to Comcast's proposal and perhaps many more deals like it in the not-too-distant future.